For many people in the UK, your home is your biggest investment, which is why it's important to make sure that you have the right protection in place for when things don't go to plan. How would you cope if you were faced with the full cost of making repairs to your home after a storm or flood, or replacing the contents of your home if they were stolen? 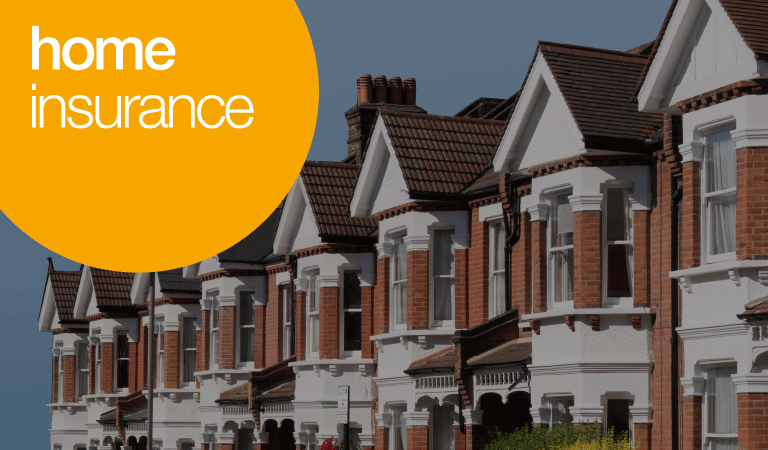 Insuring your home against the unexpected can save you time, money and give you peace of mind, so get a quote today and see how much you could save by comparing quotes from some of the UKs leading home insurance providers. For more information, visit our home insurance FAQ's for answers to the most commonly asked questions. Impact by vehicles, animals etc. For the full list please see your policy booklet. If you're not able to live in your home following a claim for one of these circumstances, the insurer will look to cover the cost of alternative accommodation while your home is being repaired. For complete peace of mind you can also choose to purchase extended accidental damage cover, which will protect you in circumstances like putting your foot through the ceiling. It's important that you get the value of your home right: Over-valuing can increase the price of your policy, however if you were to under-value you could find out that you may not be covered for the full amount if you ever need to make a claim. You can also extend cover to include personal possessions outside of the home – insure everyday items such as cameras, jewellery, keys, clothing and cash that you and your family take outside the home if they’re lost, damaged or stolen, even when on holiday. *Subject to the terms and conditions of the policy document. It’s important to get the total value of your contents as accurate as possible – this is the maximum amount the policy will pay out if the contents of your home are completely destroyed. Experts estimate that one in five households could be underinsured because they do not know the true value of their home contents – so remember to make sure you go through your house room by room when adding together the total value of your contents, and remember to include things you might not think about like curtains, carpets, wall light fittings, wall hangings, mirrors, bedding, as well as any collections you have like books, CD’s or DVD’s. home emergency cover – If your electricity fails or heating system breaks down you could be left in difficult circumstances. This policy is designed to protect you in the event of a domestic emergency, which includes plumbing and drainage, home security, toilet unit, domestic power supply, lost keys and vermin infestation. With home emergency cover the insurer will appoint a suitably qualified contractor to attend your home to try and solve your problem. Click here for more information. home legal expenses – provides you and your family with up to £50,000 in legal expenses for employment disputes, contract disputes, jury service, tax protection, property protection and bodily injury. A 24-hour helpline is also available, click here for more information. High value items such as jewellery, watches or fine art with a value of over £10,000. Contact us on 08444 930 176* for more information on high net worth home insurance.